I love the deep impression this letterpress printed logo creates – on the globe, the land looks like it’s rising right up out of the water. 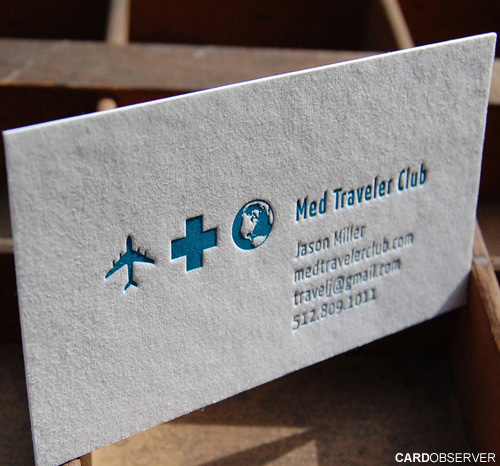 I printed these business cards for Med Traveler Club, a site which connects traveling rehab professionals around the country. I designed the logo with bold, spare symbols and plenty of white space for maximum impact. I printed the cards on my 1902 Chandler & Price Old Style letterpress using magnesium plates on 140# cotton stock.